"A Love So Great and A Grief so Deep "The pain was so overwhelming and intense, I found myself curled into a fetal position crying with no sound. The cry of pain was deep within my heart and soul. I was reduced to a child. And it was there, in that moment, that I felt God draw near me, felt His "spiritual arms" pick me up and hold me as only the most loving and caring Father could do. 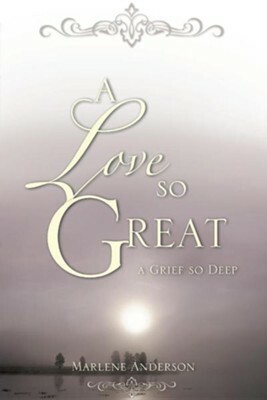 This will forever be what God is to me - my Heavenly Father whose love is so great I can't begin to fathom its depth and enormity" "A Love So Great" is the story of a great love shared between two people, and the grief that follows death. It is a story of faith and hope, agony of doubt and unbelief through dark days, and the long journey of healing from loss. As a psychology teacher and counselor, the author was unprepared for the depth and length of grieving. As she takes you through her journey, she gives the reader important information about the grieving process and shares her walk with God who met her every morning. It is informational and inspirational, and helps both the mourner and those who reach out to support those who are mourning, as it dispels myths and misunderstanding. It is a story we all need to read. Marlene Anderson is a consultant, trainer, facilitator, speaker and counselor, and has presented workshops to corporations, health and educational organizations. She has a Masters degree in Psychology and Counseling, is a licensed counselor in the State of Washington and a national certified counselor. She lives in La Conner, WA with her little dog, Dickens, and enjoys gardening, writing and speaking and volunteering at her church. I'm the author/artist and I want to review A Love So Great.